Friday evening 19.30-22.00 very busy. Angels & Demons (also uses McCanns branding) - 49 Horses 2.80 Extreme citrus burst. Evening. Doing well with overspill into the rear garden. Served on by one of the former joint owners of Past and Present in Gillingham. Good memory as he recognised me from there. Pork pies and scotch eggs have been introduced. Evening. My second visit and my face was recalled. Others beers details lost in this website's server crash. Evening until 9.30pm close. At last a reason to go to Rainham. Classic Micropub style. My only niggle is that free wifi may encourage rather than shun electronic entertainment, one of the basic tenets of the Micropub movement. The pub is found in Rainham, Kent, ME8 8AN. 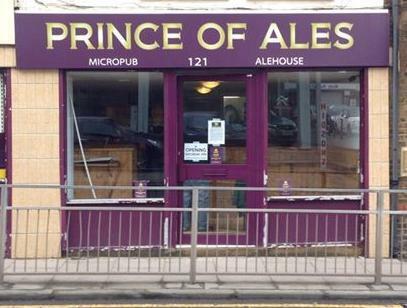 Micropub which first opened to the public on 12th March 2016 after a long battle by the owner to find suitable premises in the town. It is located in a converted part of the downsized Post Office (now physically separated). Cask ales and ciders are served from a temperature controlled cellar room on gravity dispense. Seating is on wall mounted benches at high tables and several wood surrounded booths with low tables. Garden at rear with picnic style tables. We have visited this pub 9 times, seen 32 different beers and tried 26 of them.